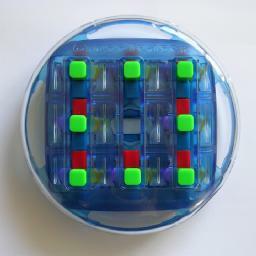 This puzzle consists of a transparent frame enclosing 8 identical coloured pieces arranged as if in a 3 by 3 grid. These pieces are three dimensional crosses, each with six perpendicular arms of different colours. The frame has three vertical slots at the front and three horizontal slots at the back through which the front and back arms of the pieces stick. There is one space in the 3 by 3 grid, and any adjacent piece can be moved into the vacant space, but the slots in the frame force a piece to roll over as it moves. By rolling the pieces around they get mixed up. The aim is to arrange them so that the space is in the middle and that the crosses all have matching orientation. The puzzle is closely related to the Rolling Cubes puzzle. The only difference is that the pieces roll in different directions when moved horizontally. Also, the enclosing frame ensures that it is not possible to reset the puzzle without actually solving it. The Crossteaser has the same number of positions as the Rolling Cubes puzzle, namely 128·9!/4!2=270,888,468,480 positions. Recent Toys, the manufacturer of Crossteaser. Hold the puzzle so that the Crossteaser logo is along the top. The front then has vertical slots, the back horizontal ones. Before you start the solution, move the pieces so that the space is in the centre. At the start and end of every step in the solution the space will be in the centre. I will call the four orthogonal directions left, right, up and down. There are several simple move sequences that move some pieces but leave the space in the centre afterwards. Suppose you roll the top piece downwards, then roll a piece to the right, then one upwards, and finally the centre piece leftwards. This cycles the upper, left and upper-left pieces around clockwise. This sequence will be denoted by UL. The inverse of this, i.e. rolling right, down, left, up, will be denoted by UL'. Similarly the pieces at the top right can be cycled clockwise (left, down, right, up) which is denoted by UR, or anti-clockwise (down, left, up, right) denoted by UR'. Cycling the bottom left pieces is denoted DL and DL', and finally the bottom right pieces DR and DR'. This solution places a single colour on the front. The colours around the sides remain mixed. Note that this phase is the same as the first phase in the Rolling Cubes solution except that the Left arm and Right arm sequences are swapped. Choose which colour you want to end up on the front of the puzzle. Do whatever moves you like to turn as many pieces as possible with the correct colour to the front, but with the space in the middle. The sequence will orient that piece correctly, but may leave it at a different position. You can solve the bottom right and bottom centre pieces in the same way. Simply hold the puzzle such that the Crossteaser logo is along the bottom and then repeat steps c and d.
To solve the remaining pieces, turn over the puzzle, making sure that the logo on this side is again across the top. Note which colour should be solved on this side (the colour opposite to the previously chosen one), and repeat steps c-e. Note that this phase is exactly the same as the corresponding phase in the Rolling Cubes solution. Choose which colour should be on the bottom side of the pieces. If there are no pieces with the chosen colour on the left or right side, then jump to step f.
Find one corner piece and one middle piece that both need a quarter turn (i.e. have the chosen colour on the left or right side). Repeat steps c-d until all the pieces have the chosen colour at the top or bottom. Repeat steps f-g until all the pieces are correct.